Update: Tarik Cohen has been doing his best to impress Chicago Bears’ coaches and fans during the preseason. In three games, he’s had 19 carries for 121 yards and two kick returns for 39 yards. Seconds before the ESPN telecast of the all-important announcement that more than 200 friends and family — plus media — had gathered to hear, the Academic Classroom Building auditorium exploded with joy and applause. North Carolina A&T’s All-American running back Tarik Cohen had been chosen 119th in the 2017 NFL draft by the Chicago Bears. Cohen’s hard-fought dream was coming true — he was going to the pros. And for the assembly of friends, fellow students, relatives, university staff and teammates surrounding him Saturday, Cohen was the only pick in the draft who mattered. They’d shown their faith, loyalty and commitment by arriving shortly before noon Saturday for the start of the ESPN telecast of Rounds 4 through 7 of the draft. Some had attended a Friday night draft party at Aggie Stadium to honor Cohen and to watch the first three rounds of the draft — a gathering held just in case a team drafted Cohen earlier than had been projected. Now, a day later, they were hunkered down for the long haul with university-bought pizza, soft drinks and juice, not knowing when (or if) Cohen would be selected. They didn’t have to wait too long. Around 12:45 p.m., Cohen, seated next to his mother, Tilwanda Newell, answered his cellphone. It was a call from the Chicago Bears; friends and family seated closest to Cohen learned the news just seconds before people monitoring the draft via the internet found out. By the time Cohen’s selection was broadcast onto the big screen in the campus auditorium, the room was already in a frenzy of hugs, high-fives, handshakes, shouts, selfies and laughing. The crescendo grew louder with video highlights of Cohen, the all-time rushing leader in the Mid-Eastern Athletic Conference (MEAC) and three-time league Offensive Player of the Year, eluding and outrunning defenders. Dubbed the “Human Joystick” for his video-gamelike escape-ability, Cohen — all 5 feet, 6 inches and 179 pounds of him — rushed for 5,619 yards, averaging 6.5 yards per carry, with 61 total touchdowns during his collegiate career, using his 4.42-second 40-yard dash speed (No. 3 among running backs in the draft combine) to rack up his numbers. Cohen was the second player selected this week from among historically black colleges and universities (HBCUs), picked after the Arizona Cardinals made Grambling receiver Chad Williams the 98th overall selection and the 34th player picked in the third round. Bears fans can only hope that Cohen can bring to the Windy City the type of excitement created by another HBCU running back — Hall of Famer Walter Payton, the No. 4 overall selection in 1975 out of Jackson State. After the hoopla died down somewhat on Saturday, Cohen expressed his joy and appreciation to his supporters. 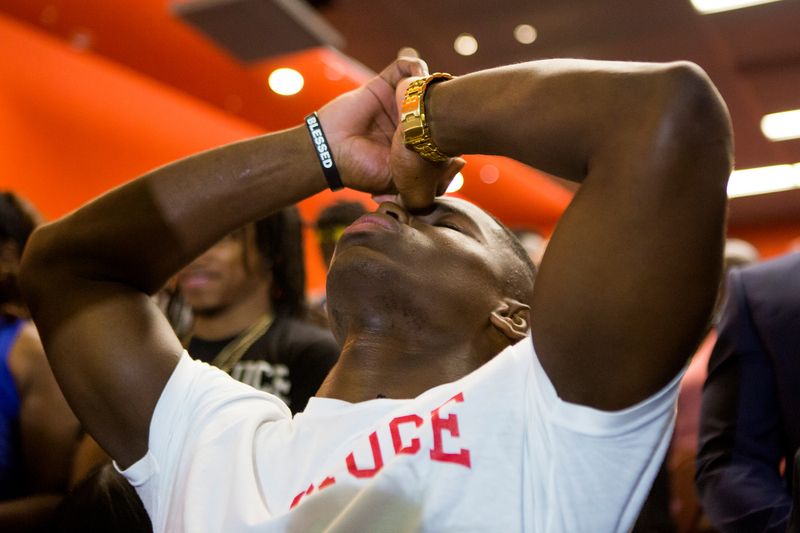 Tarik Cohen reacts after being drafted by the Chicago Bears in the fourth round of the NFL draft. Particularly, he thanked those “who supported me before I even got to college. That’s what I feel was most necessary. He thanked his university family, including his academic counselors, whom he credited with keeping him on track toward getting his degree. It was a fitting climax to a long day for Cohen. 9:10 a.m.: Cohen has the breakfast buffet at the Greensboro Marriott Downtown with members of Millennium Sports Management Group, his marketing representatives. Kurtis Stewart, president of Millennium, explained that he found out about Cohen, already enrolled at NC A&T, at a 7-on-7 football tournament. The event was a Community Weekend in Kinston hosted by a client, NFL veteran Quinton Coples, a former UNC Tar Heel star, returning to his hometown. 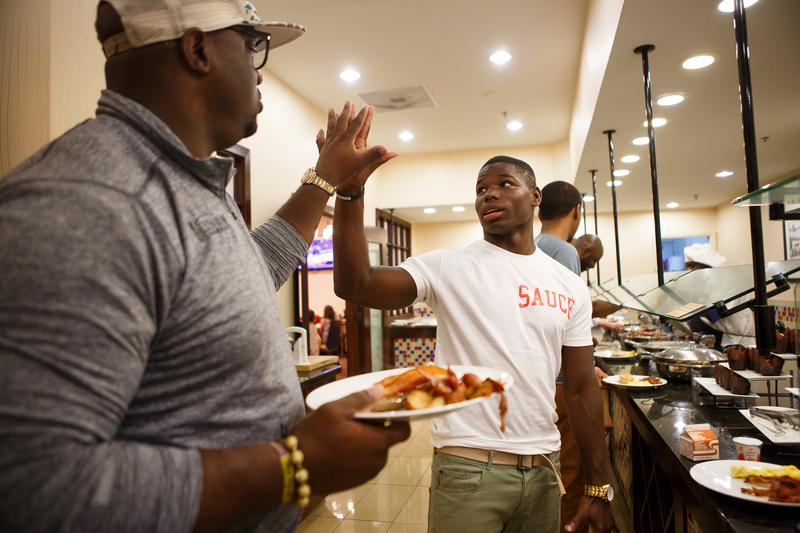 Tarik Cohen, right, compares hand sizes with Kurtis Stewart, left, President of Millennium Sports Management Group, as they eat breakfast at the Greensboro Marriott hotel on the morning of the NFL draft. “It was on a fade route,” Stewart said. “I don’t know how in the world Tarik just jumped over this kid about 6-3, 6-4 and made a one-handed catch to win the tournament for his team. 10:05 a.m.: Cohen is in the barber’s chair at Gate City Barber Shop, on Market Street across from campus. The room, appropriately adorned with A&T logos and Aggie Bulldog posters, is filled with fans excited that a local player could soon be drafted into the NFL. 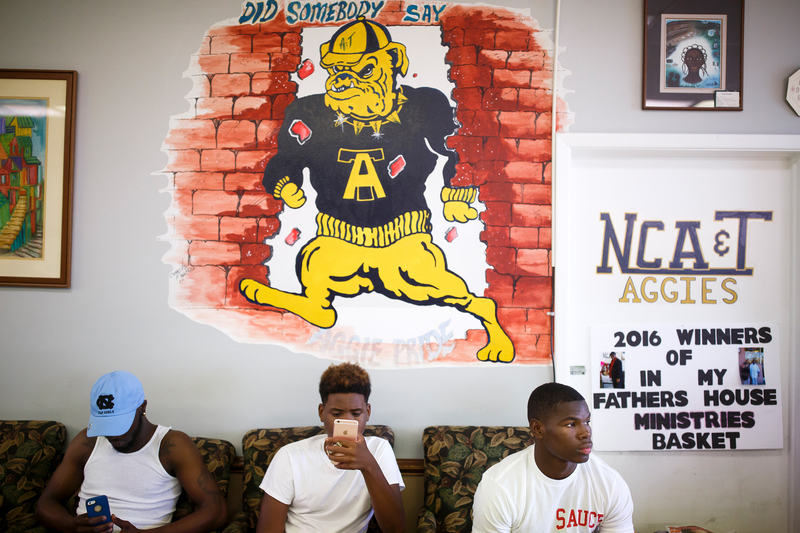 Tarik Cohen, right, waits to get his hair cut at Gate City Barber Shop near the North Carolina A&T University campus on the morning of the NFL draft. Wooten, who also handled punting duties for Southwest, angled an arched punt toward Cohen once. Both laughed Saturday about what happened next. “I don’t know how he got past the first 10 guys,” Wooten said. “He got to me and I was like this,” Wooten said, before going into a stutter step. Fortunately for Southwest Edgecombe, the 50-plus-yard return was called back because of a penalty. 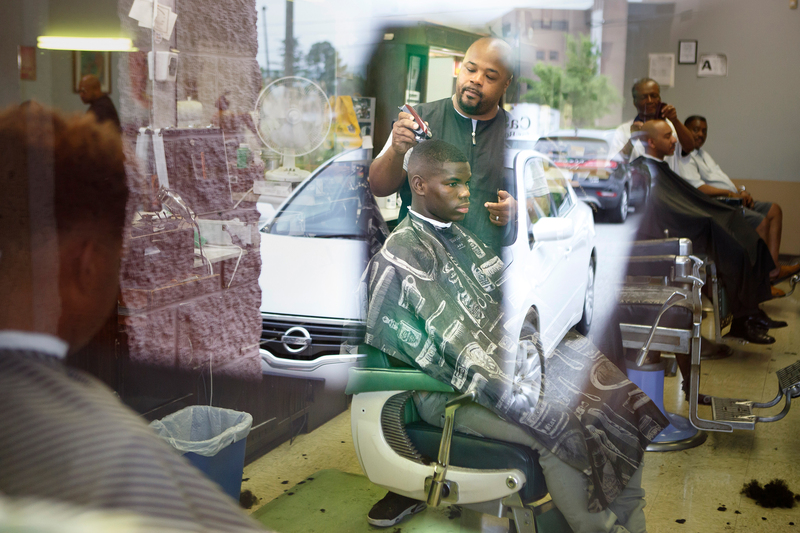 Tarik Cohen gets his hair cut by Bobby Lawson at Gate City Barber Shop on the morning of the NFL draft. Lawson says that he has been cutting Cohen’s hair for a couple of years and that Cohen always asks for the same style. 10:40 a.m.: Cohen and his marketing team arrive at the Academic Classroom Building auditorium. He spends some time on the phone navigating his mom’s trip to Triad. He estimates that she is about 30 minutes away. Cohen hugs his aunt Milltrene Newell, who arrived wearing a black sequin-crusted NFL draft 2017 T-shirt. “Tarik stayed with me for two years when he played at Bunn,” Newell explained. “His mother had relocated to Raleigh, but he was already established at Bunn and the coaches didn’t want him to leave. 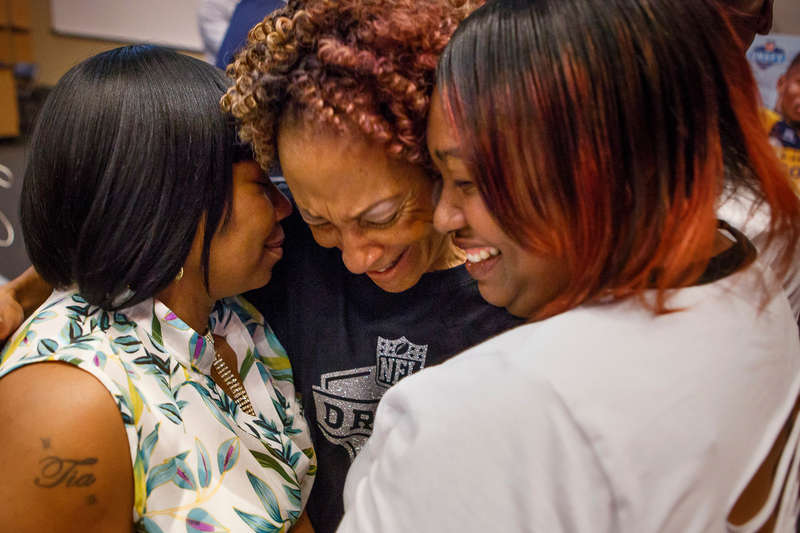 Tarik Cohen’s mother, Tilwanda Newell, left, hugs Cohen’s aunts Milltrene Newell, center, and Talesha Kearney, right, before Cohen’s NFL draft watch party at North Carolina A&T State University. “He was a well-mannered, focused kid. Just humble. He was very athletic, a straight-A student. He wasn’t an empty wagon making a lot of noise. “I tried to mold him for college,” said Newell, a graduate of Fayetteville State University. “The only problem I had was he wouldn’t clean up his room. “As a child, he always said he would play professional football. This is something he spoke into existence. Cohen, whose video of him doing a backflip while catching two footballs had gone viral, isn’t a stranger to ESPN and is completely comfortable being mic’d up to do a live interview on the network’s SportsCenter. Cohen also explains that he feels “tremendously honored to be compared to the likes of” Philadelphia Eagles 5-foot-6 running back Darren Sproles (Round 4, 130th overall pick out of Kansas State in 2005 to the San Diego Chargers). 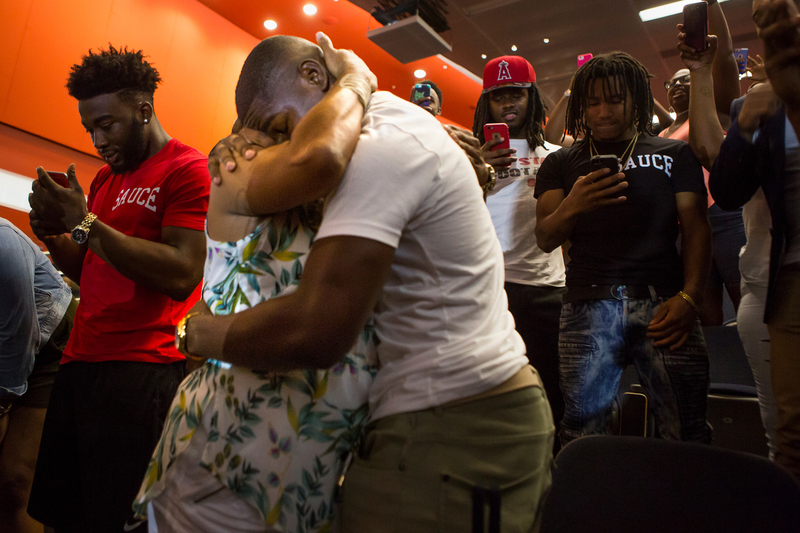 Tarik Cohen hugs his mother, Tilwanda Newell, after being drafted by the Chicago Bears in the fourth round of the NFL draft. Cohen went on to explain the origin and evolution of his series of flip videos. Plus, he added clarity about the “Sauce” T-shirt he wore during the segment. Cohen and some of his closest friends adopted the phrase two years ago to represent their “swag, attitude.” But he said they won’t take it too far or let it get out of hand. 2 p.m.: The room has quieted and most of the crowd has departed, but before the afternoon is done, a series of people — a collection of down-to-earth, grass-roots folks — from Cohen’s support system discussed how this once shy, wise-cracking companion had blossomed into a confident, upstart personality. Still, the reality is slow to sink in for his mom, Tilwanda Newell. 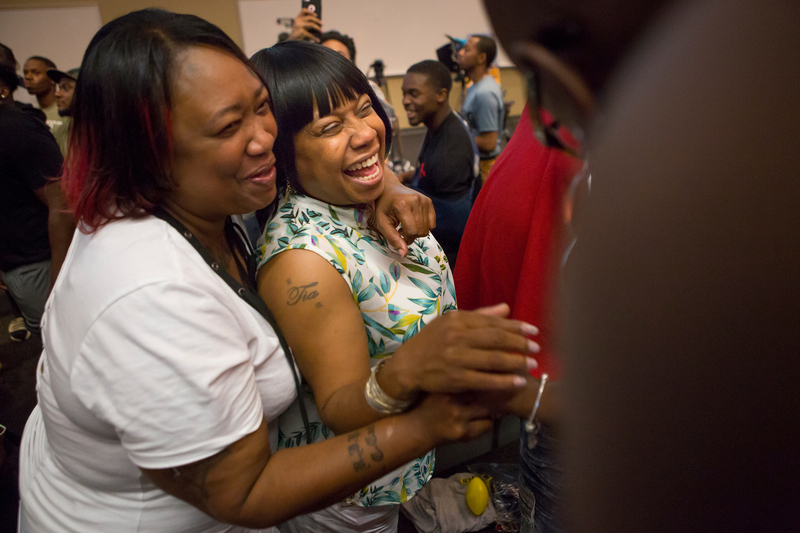 Tarik Cohen’s mother, Tilwanda Newell, right, and his aunt Talesha Kearney, left, celebrate with family after Cohen was drafted by the Chicago Bears in the fourth round of the NFL draft. Still, Newell said she never allowed herself to believe the NFL dream — “until Friday night. Right now. This moment,” she said Saturday, looking around the auditorium. Part of that focus grew from his competitive environment. With an older brother (Dashawn Clayton, 24) and a younger brother (Danta Norman, 18), twins Tarik and Tyrell Cohen, 22 in July, were in the middle and very competitive with one another. Malik Finley, who grew up like another brother and was a junior varsity teammate of Cohen’s, said he still wasn’t grasping the reality of Saturday’s events. Like many people who talk, Finley remembers Cohen talking about his NFL dream. NC A&T head football coach Rod Broadway, the only big whistle to offer Cohen a scholarship, is fortunate that others looked at Cohen’s stature and didn’t see the size of his heart. 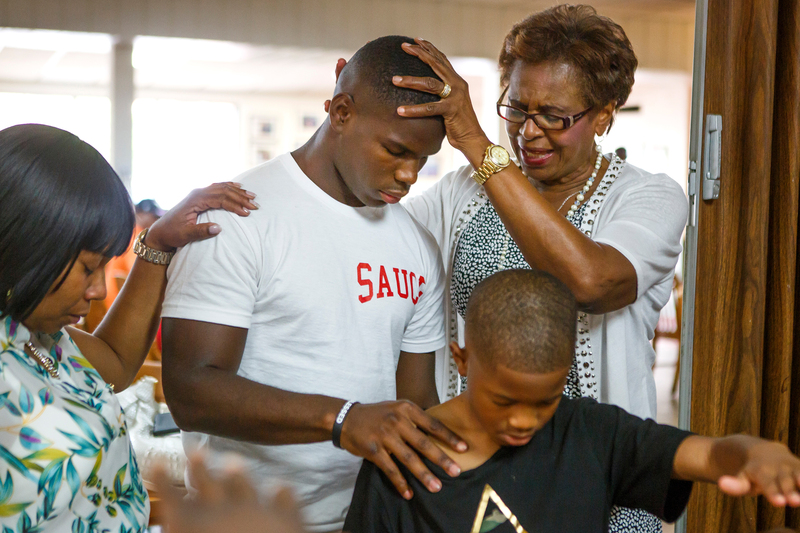 Pastor Karen Woods, right, prays over Tarik Cohen, center left, along with Cohen’s mother Tilwanda Newell, left, and his cousin’s son Tashawn Newell, 10, center right, as the family celebrates at Stephanie’s Restaurant. Pastor Woods said that she was eating when she heard that someone in the restaurant had been drafted to the NFL and she wanted to offer a prayer for him. “It only took a couple visits to his high school to realize the type of person that he was,” Broadway said. “It took only a couple practices to realize he was a special talent. Greatness as an athlete and as a person. Agreed, said Brandon Parker, the 6-foot-7, 300-pound MEAC Offensive Lineman of the Year, who will be a fifth-year senior in the fall. “He’s an uplifting player; he’s a little ball of energy,” Parker said. “He does a good job of keeping us positive. He’s kind of like our spirit animal on the team. Parker said he has benefited from Cohen’s exposure. “By him being on the front page, that brought recognition to me,” Parker said. “The scouts are going to look at who’s blocking for him. I’ve been fortunate enough to stand out to the scouts. “So they’re going to come back and look at me. … I can’t thank Tarik enough for that. NC A&T instructor and academic tutor Ella Hairston said Cohen, a sports medicine major, remained grounded despite a rapid rise to national stardom. “He remained humble,” Hairston said. “I’ve never seen him pretend that he was something other than a student. 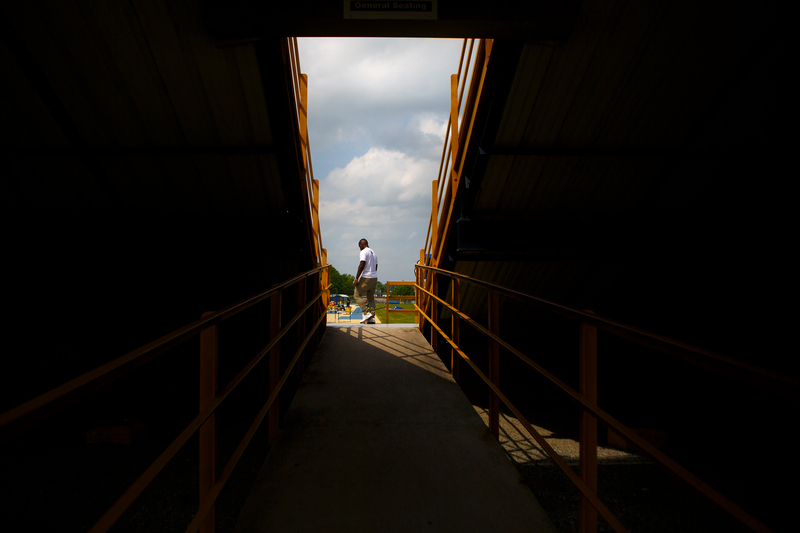 2:30 p.m.: Cohen wants to revisit Aggie Stadium with friends and family. He wants reflection in a place where he helped create so many memories. It is ground zero for the amusement park ride known as the “Tarik Cohen experience,” which frequently produced touchdown runs of 50-plus yards. Tarik Cohen walks into Aggie Stadium at North Carolina A&T University after being drafted by the Chicago Bears in the fourth round of the NFL draft. Cohen recounted one of his most exciting runs in his NC A&T career, during a 42-17 homecoming victory last October against Florida A&M. It was a 19-yard score in which he went airborne to cross the near-side pylon and stretch the Aggies’ lead to 14-10 in the third quarter. “When I landed in the end zone, I ended up in a pack of alumni,” former players who had returned to help celebrate GHOE (Greatest Homecoming On Earth; you can Google it). “They all came and hugged and high-fived me,” Cohen said. 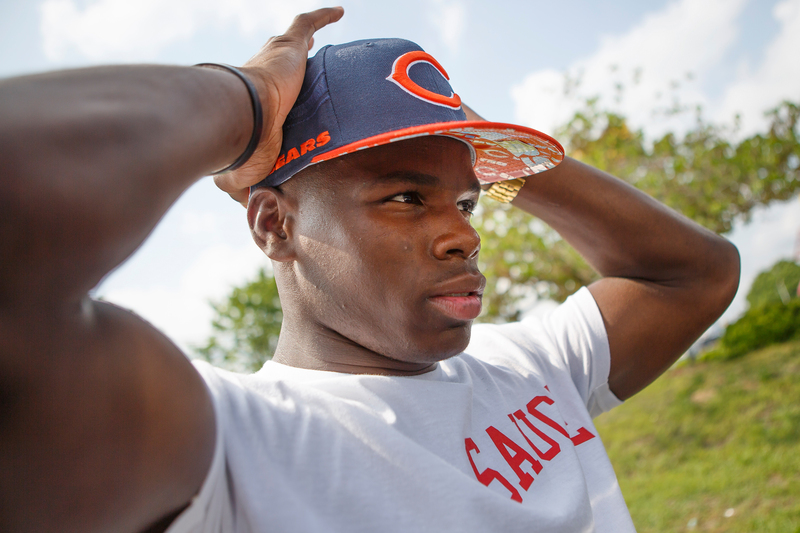 Tarik Cohen adjusts his Chicago Bears hat after being drafted by the team in the fourth round of the NFL draft.